Includes Kennebec River Resource Mngmt. Plan, general Bay conservation materials, notes on comprehensive planning around the Bay, & other topics. This is the complete agreement including exhibits pertaining to the removal of Edwards Dam. go to this FERC link: http://elibrary.ferc.gov/idmws/docket_search.asp - Insert P-2389 into blank for docket number]. Resource Services was hired by FOMB in 1997 to help document the current state of scientific research in Merrymeeting Bay and to assist us in determining future research priorities, needs and gaps. We have to varying degrees as of 2012 addressed the following topics: Hydrography of Bay and tributaries; Sediment dynamics, abundance of aquatic plants and land use; Accumulation, effect and source of contaminants in sediments and wildlife, Exotic species. John Lichter of Bowdoin College has looked at Nutrient dynamics, Trophic structure and along with MDIF&W, Waterfowl abundance. 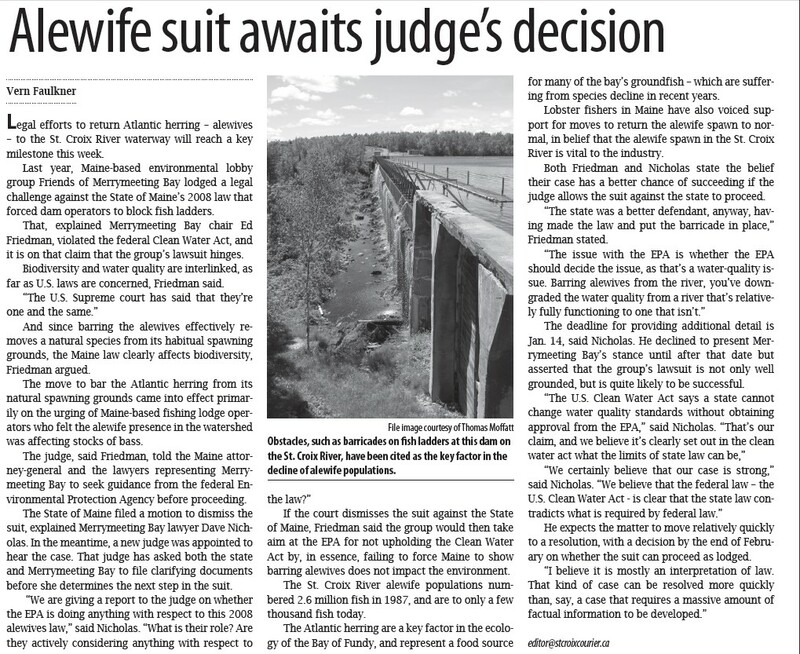 An act to stop the alewives restoration program in the St. Croix River - Have the Canadians and the Biologists gone berserk? the story of how a group of fishing guides in Maine convinced the state government to keep a native fish species out of their lucrative waters.